Hello Ladies. 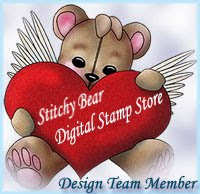 Here is my DT card at Whoopsi Daisy challenge blog. Our challenge this week is to make a Tag, or add a Tag to your project. I decided to add a Tag to my card. Digital image here from sheet #354 and you can perches HERE. I colored image with Copic. I decided to add wings to my image, by using butterfly rubber stamp by SU. First i embossed butterfly with Gold powder, then colored with copic. Is it a butterfly. ...is it a fairy? Oh my word Nataliya, this card is spectacular and totally magical. Oh the sparkle on those wonderful wings and the gorgeous colours ...my oh so talented friend, you surpass yourself. I hope you have got someone Very special in mind to receive this card because it truly is such a special creation.